How was your weekend of thrifting? Mine was a ton of fun. Thanks to Kristi, I found out about a fantastic garage sale about 20 miles from where I live. This man had a quonset full of vintage items. The best part was that the 90% of the items were marked $1 or less. I kid you not. The worst part is I only hit it on the second day. So I wonder what I missed. I know I need to focus on thanking the junkin’ gods and Kristi for letting me know. I ended up filling, not packed, but filling the back of my Ford Edge for $36. I have not had the chance to go through it yet. I will take photos as I go through it and post info, however I do have other recent finds to tell you about. I fell for this bright yellow vintage typewriter. Are all typewriters considered vintage? Do they make new ones now? I really have no idea. However, I love this color of this one. It even is quirky in that the “z” and the “y” are mixed up. I wonder why? Then I came across this beauty, a white typewriter. So it was a month of typewriters. This one is in great condition too. I am selling them because I already have an older one. But they are beauts. 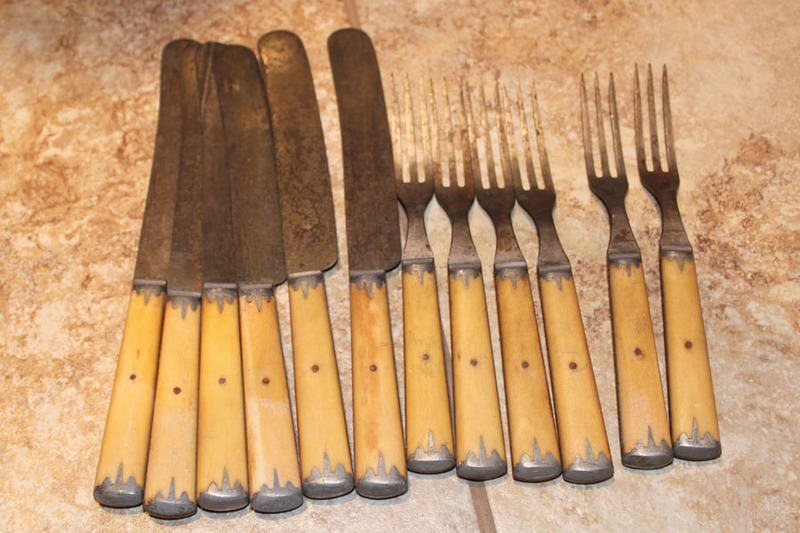 I came across these forks and knives. Love the 3 prongs and the wide blade edges. They looked old. The person I got them from (she was in her 60s) said they were her Grandma’s. They are American Cutlery Company. I haven’t found any exactly like them. Trying to determine if they are bone or Bakelite. They could be from the late 1800s. 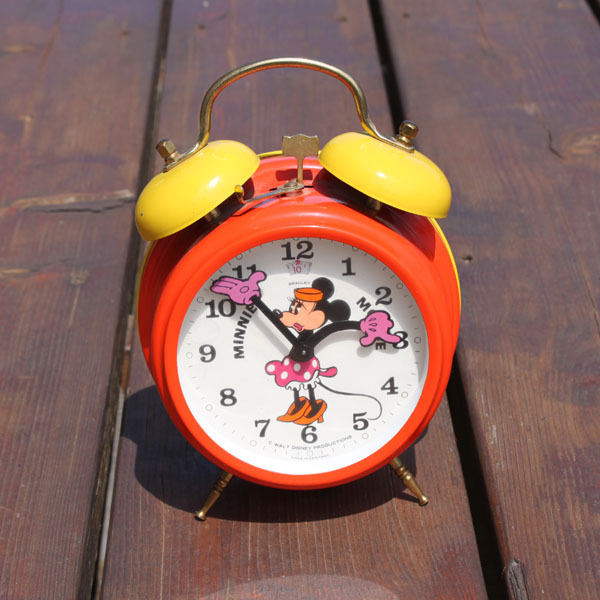 Then I came across this Minnie Mouse Twin Bell Alarm Clock. It is in amazing shape. Love the color. It is made in Germany. In my research I am finding similar clocks, but none that have the flat bell hop hat. The ones I found online have Minnie in a hat with a flower. So still trying to figure out this one exactly. I found a couple of unusual items under a table. The lady just wanted to get rid of them. First these empty bottles. I am not into bottles, but the price was right. My favorite are the two Nehi bottles. Makes me think of Radar on M*A*S*H. Anyone remember Grape Nehi? 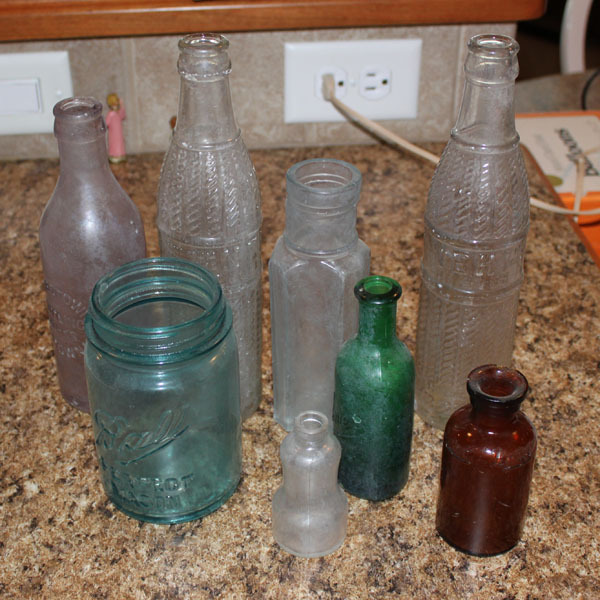 The other item was these medicine bottles that still have medicine in them. 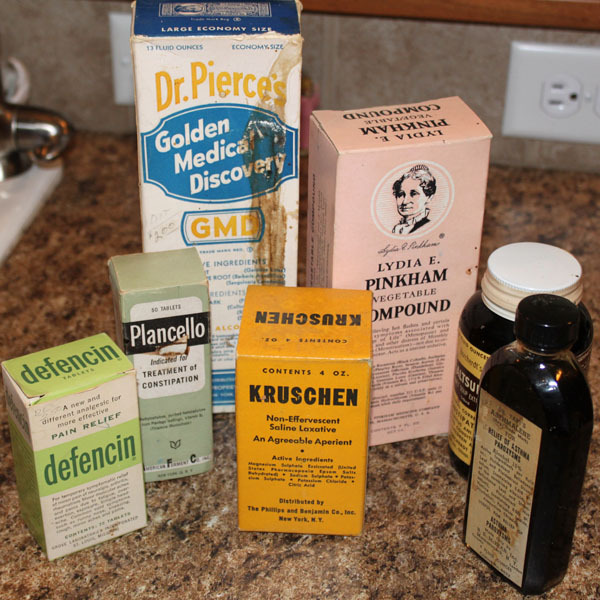 The woman said her in-laws were pharmacists. She was so happy to get rid of them. I got them just to read the bottles. Most are medicines to treat constipation. My favorite though is the pink box, Lydia E. Pinkham Vegetable Compound. It was for “relieving hot flashes and certain other symptoms associated with ‘Change of Life’….Acts as a uterine sedative.” Oh my, that made me laugh. Maybe because I am right on the cusp of “Change of Life”. Ha. Maybe I need a uterine sedative. Almost makes me want to swig this whole bottle even if it is 60+ years old. Not. So did you have any luck? Find any unusual items? 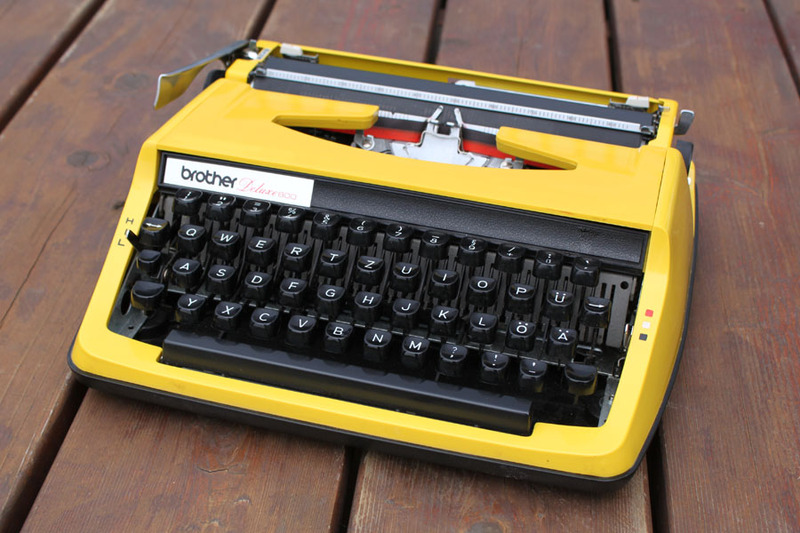 GORGEOUS yellow typewriter! I LOVE yellow, it’s so happy! thank you. I agree, very happy color. I love the cheerful yellow of the typewriter! Thanks, me too. I love finding bright colored vintage items. Love your finds! I got there later on Saturday so I can’t imagine what I missed. If they do have another this fall and you hear a date, let me know! You still found some great things. I was there in the morning on Sat. and didn’t see the trunk. Great find. I will let you know if you hear anything. Please do the same for me. Thanks. I just love that yellow typewriter! It reminds me of a yellow “portable” TV my aunt had in the 70s. So cute. The flatware is also gorgeous! A yellow portable TV would have been so fun to have. Glad it brought back a good memory. Love that yellow!!! 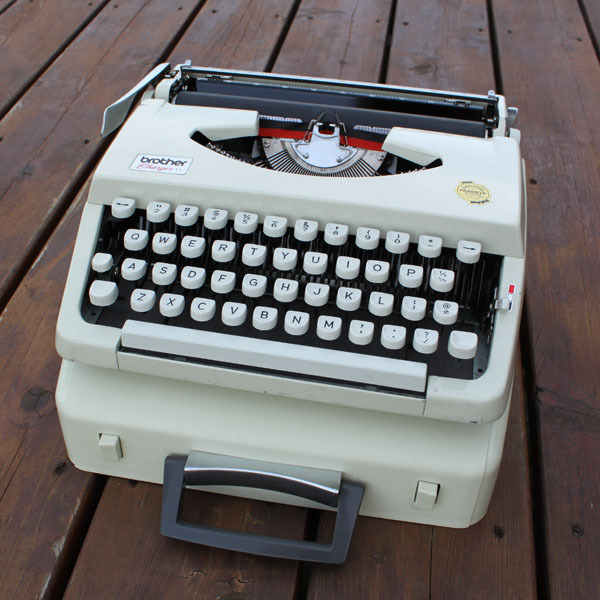 Great typewriter, thanks for sharing at cap creations.